Protests quickly escalated outside a Brooklyn federal detention center as demonstrators and reporters were pepper sprayed by authorities on Sunday. 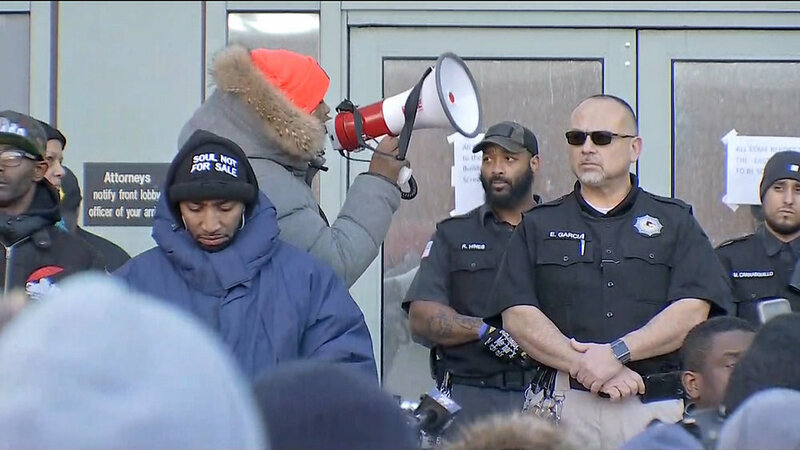 Some demonstrators protesting the lack of heat and electricity at the Metropolitan Dentention Center in Brooklyn attempted to get into the facility, and witnesses say guards pushed them back and sprayed them with a stinging substance. Rallies have been ongoing outside the Metropolitan Detention Center since it came to light that inmates have had little to no heat and electricity for days. Federal prison officials say the partial outage was due to an electrical fire. The Legal Aid Society said they wrote to the Brooklyn MDC on January 22 about the lack of heat and electricity, but that they never received a response. Protesters say the situation is inhumane. "I think it's truly disgusting,” said one demonstrator. “These are human beings who are suffering in here, men are sick. I talk to my father every day and I haven't heard from him in over two weeks. It really hurts, that's my best friend. He's done everything for me." The city has said they will provide blankets and generators. Brooklyn Borough President Eric Adams says he will be outside the center with interfaith leaders this afternoon, demanding that clergy at least get to speak to the inmates to provide support. Congressman Nadler, Comptroller Stringer and others toured the prison on Sunday and have confirm that the prison is warmer than it was on Saturday, but that the electrical power is still down. The Bureau of Prisons expects work to restore power at the Metropolitian Dentention Center to be done by Monday. They say medical staff has been going cell to cell to check on inmates and legal visits will be allowed today. Governor Cuomo has also issued a statement condemning the MDC of Brooklyn, calling for an official investigation into the circumstances at the detention center.